There is no better feeling than taking a team from the lower leagues to the very top. The Championship has a couple of fallen giants lurking around playing for a mid table finish. One of these teams is Leeds United, a team which has fascinated me for years and has always been on my radar when figuring out what team to manage. Leeds have been down in the dumps for too long. It's time to bring them back to their former glory. I am not going to bore you with all the historical facts about Leeds, however you should know that they have won the Premier League three times and the Euro Cup (old Champions League) two times. Bad financial management had Leeds relegated in 2004 and they have been struggling in the championship (with a short down period in League One) ever since. I like to be optimistic, so with that in mind I chose the three top expectations, which most importantly means that I have to reach the Championship playoffs. This gives me a transfer budget of around 600k and a wage budget of 200k. Not much to go on, giving that I am used to managing higher league teams with a budget of 30-60million, but it will have to do. My main focus will be finding cheap talents and loaning players from higher ranking clubs. I have opted for the 4-1-2-3. 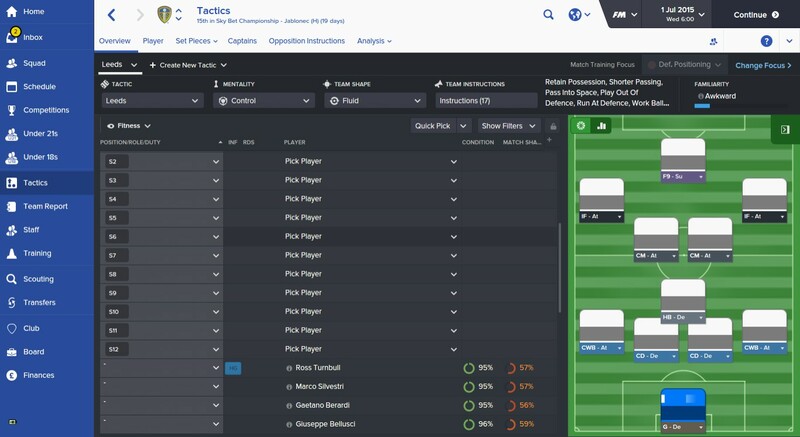 Hopefully this tactic can help the players reach their full potential. It is a tactic with focus on the defencive as well as the attacking aspect. The central defenders and the Halfback almost form a three man defence, so hopefully we will have a solid defence. The attacking aspect comes from the to attacking midfielders, the inside forwards and the wing backs. The false nine attacker will drop down and leave room for the inside forwards to get goals. Lewis Cook - This 18 year old central midfielder is by far the most talented player of the group. With a potential ability of 158 he has the ability to become a solid midfielder in the premier division in the future. In comparison Paul Pogba has a potential ability of 192. Charlie Taylor - This 21 year old left back is has a potential ability of 142, and has some pretty solid stats. 13 in crossing which is okay considering he is going to play a vital role in the attacking play, where he should supply a bunch of crosses that could lead to crucial goals. Hopefully his crossing ability can evolve over time. Overall this team has a pretty good defence but are lacking a lot in the attacking part of the field. Therefore my main focus in the transfer window will be strengthening the attack. It is hard to find suitable players when I am used to playing the likes of Memphis Depay, Alvaro Morata, Koke and so on. I have to lower my expectations in what players I can find on this somewhat small budget. Bertrand Traoré - This player does not have very good stats, but in turn has enormous potential. 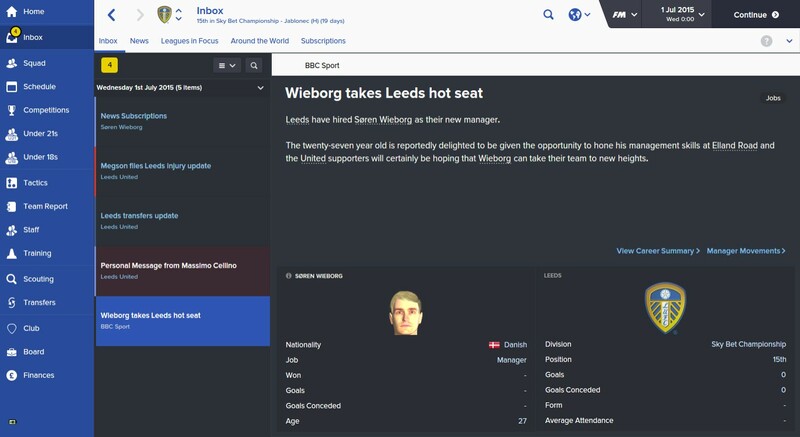 An luckily he is available on loan, so hopefully I can sign him on a season long loan. If I succeed he is the ideal player to play on the right inside forward position. Nahuel Leiva - This Left inside forward is available for loan and hopefully he will want to sign with me, however i doubt it. He is a talented young player with great stats in both dribbling and technique, he would be an awesome addition to the team, so cross your fingers! I hope you will join me for the second instalment where i try to tackle the upcoming pre season and start of the Championship season. Hopefully I will have signed some useful players who can help bring back Leeds United back from the dead. 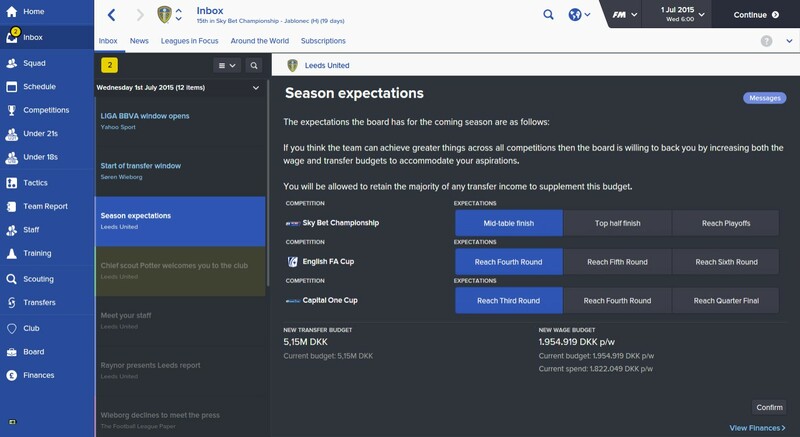 There is no better feeling than taking a team from the lower leagues to the very top. The Championship has a couple of fallen giants lurking around playing for a mid table finish. One of these teams is Leeds United, a team which has fascinated me for years and has always been on my radar when figuring out what team to manage. 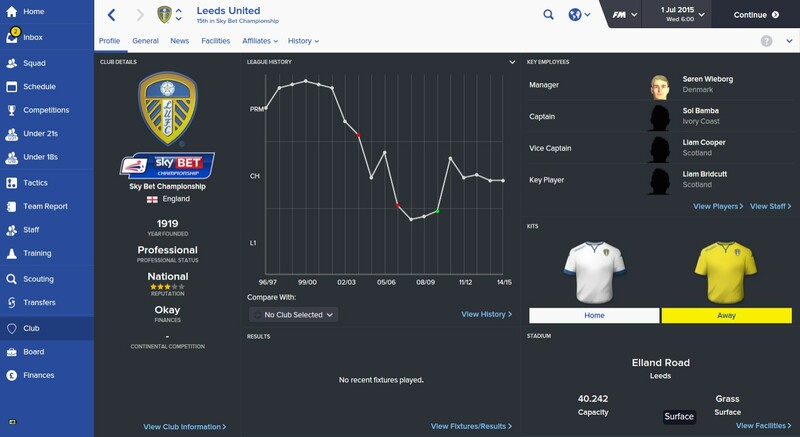 Leeds have been down in the dumps for too long. It's time to bring them back to their former glory.